Maryland left the bases loaded in the ninth, losing to their former head coach and the Michigan Wolverines in the Big Ten Championship Game Sunday at Target Field in Minneapolis. 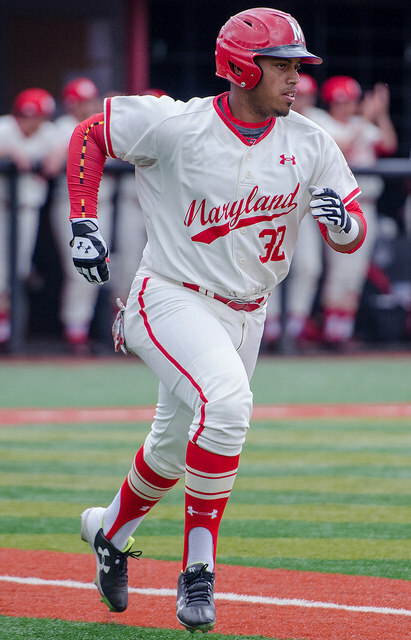 The Terps scored one run in the eighth and one run in the ninth but stranded three when Brandon Lowe popped out to left field to end the game. Maryland got hits in the ninth from Nick Cieri, Jamal Wade and LaMonte Wade to put the pressure on Michigan closer Jacob Cronenworth before Lowe popped out, sealing an NCAA Tournament bid for the Wolverines. 1. Top of the 8th – 4-1 Michigan – Terps batting with 2 on and 2 out: Jose Cuas doubled to right field past a diving Johnny Slater. With Kevin Martir rounding third, base coach Rob Vaughn threw up a stop sign. However, the wrong guy noticed it. Vaughn intended to stop Cuas at second, but Martir who was rounding third, noticed the signal and came to sliding stop in the grass in foul territory. The Michigan relay came to third base, where Travis Maezes tagged out Cuas to end the inning before Martir reached home plate. The play cost Maryland at least one run. If the Terps had been on the same page, they would have had Cuas as the tying run at second with two outs for Anthony Papio. Instead, the Terps entered the bottom of the eighth down by two. Martir, Cuas and Vaughn’s miscoummincation may have cost the Terps a chance to win the Big Ten Tournament. 2. Bottom of the 4th – 0-0 score – runner at 1st and nobody out – Maryland starting pitcher Taylor Bloom fielded a comebacker and mis-fired on a throw to second base. The ball caromed off shortstop Kevin Smith’s glove and into left center field, giving Michigan runners at the corners and nobody out. The error cost Maryland a potential double play and sparked Michigan’s four-run rally. 3. Bottom of the 4th – 2-0 Michigan – 2 outs, bases loaded – Rob Galligan bounced a curveball and catcher Kevin Martir was late in his attempt to block it. The ball bounced through Martir’s legs and allowed Cody Bruder to score the third Michigan run. 4. Bottom of the 4th – With two Michigan runs already across, Rob Galligan walked three consecutive Wolverines, adding fuel to fire in what was a disastrous top of the fourth for the Terps. 5. Top of the 7th – Anthony Papio led off the inning with a double off the center field wall. The next three batters struck out and Papio never got beyond second base. The Terps also left the bases loaded in the third and ninth innings respectively, stranding nine runners on the day. The Terps lost their cool during that seventh inning, as head coach John Szefc was ejected after Nick Cieri, Tim Lewis and the entire Maryland dugout vehemently argued several strike calls made by home plate umpire Jim Schaly. It was just one of many frustrations the Terps experienced Sunday. But perhaps the most significant reason the Terrapins will head home disappointed is because of their result in the conference championship last year. Maryland lost to Georgia Tech 9-4 in the ACC Championship game a year ago, meaning they’ve blown consecutive opportunities to bring home a conference championship. The Terps will head home to watch the NCAA Tournament selection show Monday. The show gets underway at noon on ESPNU. It appears likely the Terps will secure an at-large bid, as the players look forward to getting back on the field.